Some Internet idiot tried to manufacture outrage over the new M&M’s Caramel’s packaging. They complained that the red and the yellow cartoon M&M guys are ripping apart their orange candy comrade. All I can say is, if that is in fact the case, then that little fella’s guts are delicious. 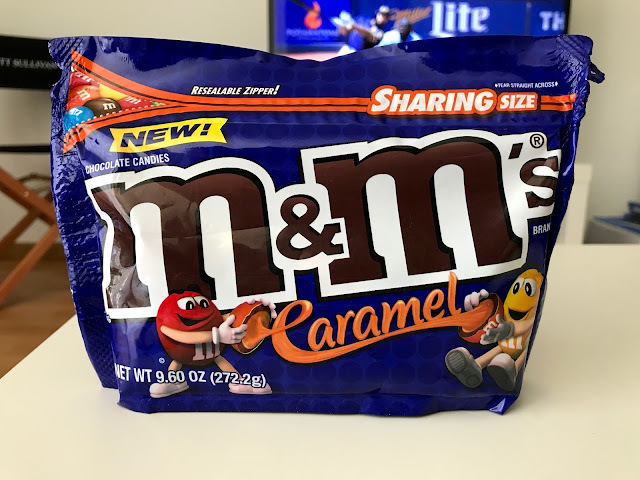 I mean, did we need Caramel M&Ms? Nope. Would I buy them instead of, say, regular plain M&Ms or Peanut M&Ms or, for that matter, Peanut Butter M&Ms or Almond M&Ms or even the new Strawberry M&Ms? Not a chance in hell. They’re still pretty good, though. They're kind of like little candy shell-covered Rollos or tiny knots of Twix. I’d rather have a real Rolo or an actual Twix, mind you, but I’ve got no problem finishing the whole bag of M&Ms Caramel. No problem at all. Don’t tell that Internet idiot but it’s gonna be a whole Spanish Inquisition's worth of M&M torture up in my mouth. Let the carnage begin!